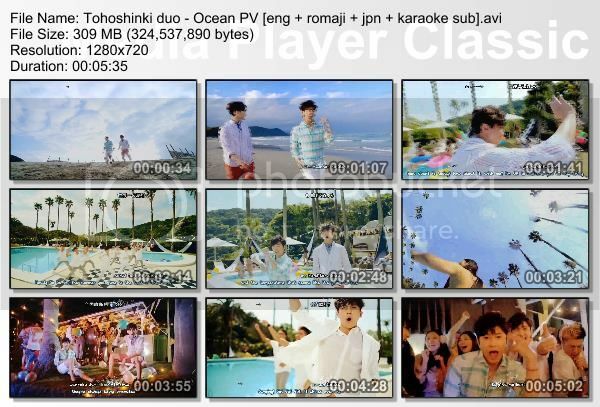 Tohoshinki duo's new single : Ocean! but this is the only full version of this PV that I can find. The SSTV version is only 5:08 long while the full one is 5:35. Ooga Jaka Ola give me beat! Ohhhh my, you're going to sub the entire TIME Tour concert dvd now too? O.O *dies* Wooow, that's A LOT of work though there, sis. My hats off to you if you plan on doing that. xD Pls let me know 'when' you're thinking of tackling this. XD Thanks, once again. Re the entire concert...no...that's alright. I know it was too much of me to ask and I shouldn't have expected you to in the first place either. I KNOW it's a hell-of-a-lot-of-work as well. So again, my deepest apologies. it's alright dear, no need to apologize XD if only I can make this a paid work, I'd sub all day and night till every concert is subbed. This is indeed very fun to sing XD Ooga Jaka Ola give me beat! ahhh...no wonder! lol Ok, now that makes sense for me. I was wondering as to 'why' there were a lot of...well...I don't mean to put down anyone that tries doing them but, why there weren't so many goods ones out these days. :( Yeah, I noticed that too. (i.e. tempos fast or slowed, etc.) Some subbing even doesn't match along w/the songs too sometimes. O.O Like, the tempo w/the subs are off just a tad. lol Jap companies are very strict, so to avoid the video being detected, they mess with the audio.